… And what we all need. I read an article about a retired man who volunteers at a local hospital in the ward for premature babies. All he does is hold babies close to him in silence. Nothing more is needed. In the arms of a loving human being, they thrive. Sharing our whole presence and open heart with an other, is nourishing and healing. No words are required, just our wholehearted presence. Perhaps hugs are the short version of this. Next time you hug someone think of it as holding in close silence. I feel it. Thank you Betty 💕 Sending one right back to you! I think there is much unrecognized sadness in this season of joy, and the comfort of a simple hug can go a long way. 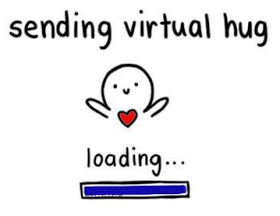 Sending you a big virtual hug and warmest wishes, Val! Yes that is all we often need! Such deep nourishment. Beautiful truth. Being with another, just being there, is such a gift. Thank you for this. This is a beautiful thought …and post, Val! Made me think of a precious memory of a dear friend of ours who hugged me many years ago…just holding me in silence for a long time. That was the last time I saw him and three weeks later his spirit moved on.